Golden Macaroni and Cheese - quick homemade macaroni and cheese topped with Ritz crackers and baked. SO good - I could make a meal out of this! YUM!! Can easily half or double the recipe for a crowd! Macaroni tossed in a homemade cheese sauce - butter, flour, milk, dry mustard, onion, Worcestershire sauce and cheddar cheese. Ready in under 30 minutes! I love homemade Mac & Cheese. It has been way too long since I made some, so I decided to remedy that last weekend. This recipe is very easy to make. It only takes about 10 minutes and it is ready for the oven. It is super creamy and cheesy! This recipe is very easy to half or double for a crowd. 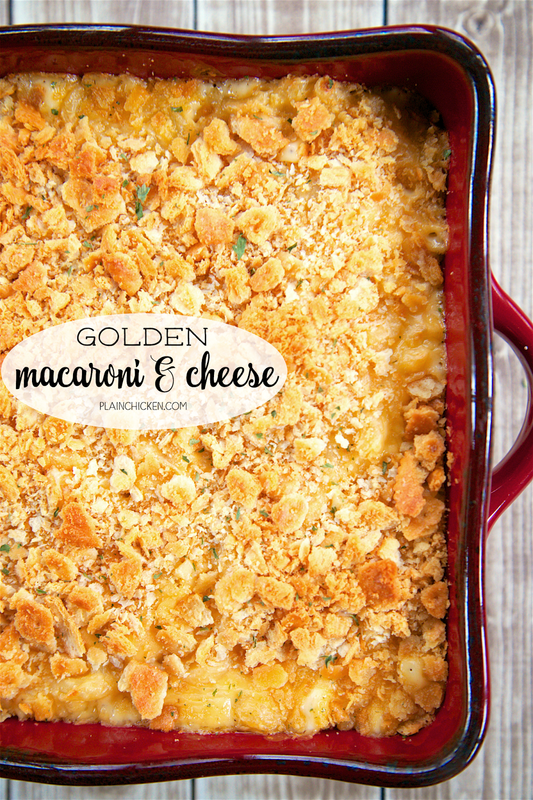 I topped the Golden Macaroni and Cheese with some crushed Ritz crackers. 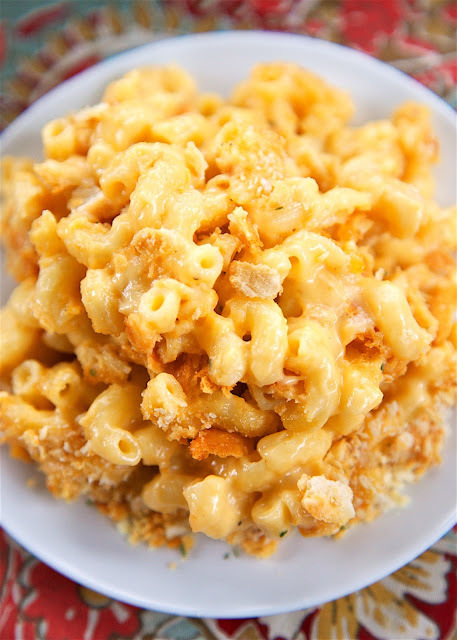 You can use breadcrumbs if you don't have any crackers, or just bake it without a topping. Either way, it will still be delicious!! 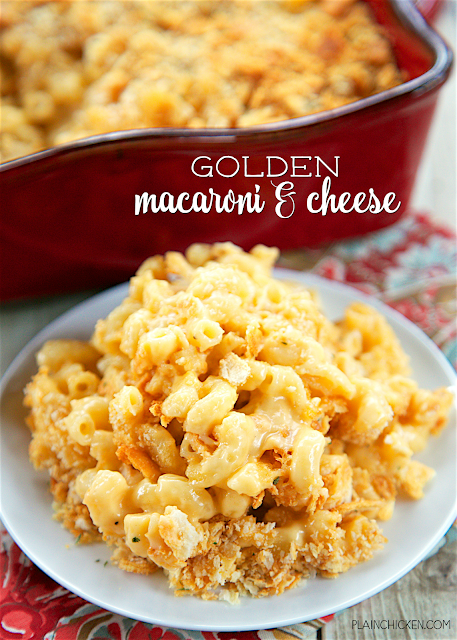 We loved this Golden Macaroni and Cheese! I could have made a meal out of it! It goes great with everything! We like to serve it with grilled chicken, pork chops and chicken tenders. Preheat oven to 400ºF. Lightly spray an 8x8-inch pan with cooking spray. Set aside. Cook pasta according to package directions Drain and set aside. In a medium saucepan, melt butter. Whisk in flour, cook 1 minute. Slowly whisk in milk. Cook until thickened. Stir in salt, pepper, dry mustard, onion powder, Worcestershire and cheese. Stir until cheese melts. Remove from heat. Stir in cooked pasta. Pour into prepared pan. Top with crushed Ritz crackers. Bake for 20 minutes, until bubbly. This sounds really good. I've been looking for an alternate to the boxed one. I pinned it to my recipes I want to try. Thanks for sharing it. I've made this several times and it's actually in the oven right now.. It's a hit with the family! Always requested at family gatherings! Thanks for sharing!